Celebrity personal trainer in NYC, Terri Walsh, whose private gym in Soho caters to celebrities and high profile clients, has found a way to provide her highly effective and sought-after training advice to the budget-conscious client as well, effectively recession-proofing fitness training for women world-wide. Terri Walsh's online fitness program is only $14.99. Comes with FREE support. With 25 years of experience of training New York's A-listers at rates of up to $300/hr, Terri is now offering her women's fitness program for immediate download for just $14.99. 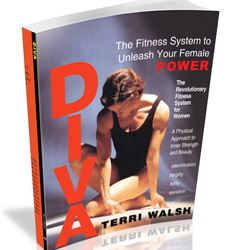 Walsh's DIVA system stands for Determination, Integrity, Vitality, and Aspiration, and helps women to harness the same qualities that make them successful mothers and CEOs to achieve their fitness goals with sound exercise techniques that deliver A-list results from wherever they are via her downloadable fitness book and free support community. The program includes workout routines that can be adapted for any fitness level, and completed in the gym or at home, and 24/7 on-line support via a FaceBook group set up by Walsh, that ensures members have access to a community of women working on the program, as well as a means to reach her directly with any questions. Her FaceBook application, the DIVA Fitness Factory, also provides tools to keep the system fun and motivational. Included are standard fitness tools like body fat calculators, but also motivational tools that let clients "throw sneakers" at each other as a reminder to stay on track, or send each other healthy virtual snacks. Making the system effective, fun, and most importantly affordable, was key to Walsh. Says Walsh: "Women are often the first to give things up for the sake of their families. I wanted to create a system that could deliver the same results I promise my private clients, that was also affordable and fun. The advent of social networking has really let me bring fitness to people's fingertips, wherever they are, for just $14.99. As a trainer, I can't stop the recession from affecting women's wallets, but I wanted to do all I could to keep it off their waistlines." Terri Walsh's online fitness program is only $14.99. Comes with FREE support. Celebrity Personal Trainer Fitness Program is only $14.99 and comes with FREE support.Terri introduces her fitness book and the results you can get.